Description: The 172 foot tower is a functional bell tower capped by a pointed spire. The top of the tower houses the bells and an observation area. The base of the tower is a covered archway, with open access through three arches on each side. The belfry originally contained twelve manually operated bells. Today it houses fourteen mechanical bells. The surrounding hedge and lawn were designed by William C. Coker, a professor of botany at the University and the creator of the campus arboretum. The largest of the bells is inscribed with the name of Governor John Motley Morehead, the grandfather of John Motley Morehead III. Unveiling & Dedication: The monument was dedicated to the University on Thanksgiving Day in 1931. Governor O. Max Gardner delivered the dedication address. Post dedication use: Each May, graduating seniors may climb the tower for a view. 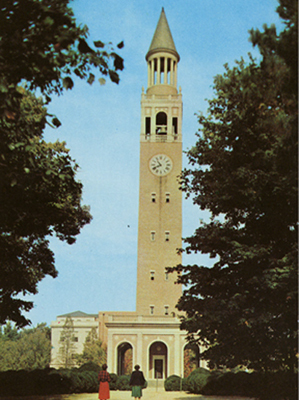 Subject notes: In the 1920s, John Motley Morehead III had proposed the idea of a bell tower to then UNC President Harry Woodburn Chase. Morehead wanted to place the tower on South Building but the university declined. In 1926, Morehead again proposed the tower on top of plans for what would become the Wilson Library, however Wilson wanted a dome on top of the building. Morehead later suggested another location without success. The idea was finally realized through the combined sponsorship of Morehead and Patterson, a New York businessman. The tower is closed to the public, however each May graduating seniors may climb the tower to enjoy the view. Location: The tower sits on the east side of South Avenue, next to Fetzer Gym and near Kenan Stadium. Landscape: The hedge and lawn area designed by William C. Coker frame the tower. Pedestrian paths lead from the area to the stadium on one side and to the sidewalk along South Avenue on the other side.